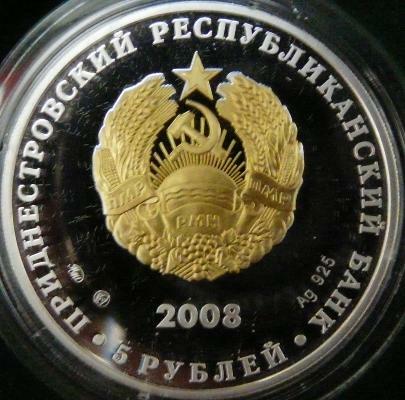 Obverse: denomination "5 RUBLEI" (Cyrillic), coat of arms of the self proclaimed republic of Transnistria (bearing hammer and sickle), inscription "PRIDNESTROVSKII RESPUBLIKANSKII BANK" (in Cyrillic and Russian) meaning "[TRANS] NISTRIAN REPUBLICAN BANK", year 2008, at left mintmarks, at right the silver fineness - Ag 925 Reverse: image of an attack, with gilded representations of a soldier, an officer and a banner-carrier, inscription "55 P. PODOLSKII P." (with Cyrillic letters, in Russian, only with initial letters for words PEHOTNYI and POLK; pehota means infantry, and polk - regiment) meaning "REGIMENT 55 OF INFANTRY PODOLSK"
Podolsk is a town near Moscow, in Russia. 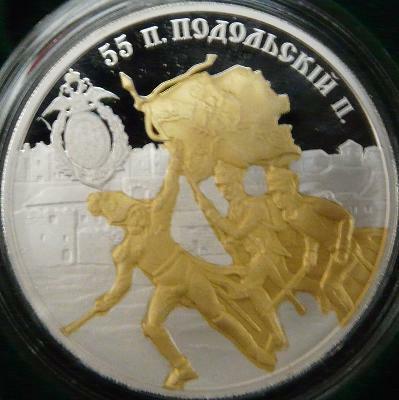 The origins of the local infantry regiment can be traced down to year 1798, and the denomination "55th Infantry Regiment Podolsk" dated from 1864. The regiment participated at the Crimeean War and to the Russian-Romanian-Turkish War from 1877-1878 - for the Romanians, the Independence War. In 1903 the regiment was moved to Bender (Tighina), in the Gubernia of Basarabia. A monument was erected here in year 1912 for the regiment. During World War I the 55th took part to the Brusilov Offensive from 1916.